“How many clowns can you fit into a clown car?” I’m sure you’re all familiar with that question. A clown car, often used as a prop in a circus or in a gag film, is used in a routine where a lot of clowns emerge from one tiny car. The video below is kinda similar to that. Except that it’s a dog house. They call it “The Basset Hound Clown Car”. It’s a doghouse but it can fit more than just one Basset Hound! Can you guess how many of them are in there? Watch the video below and see how this doghouse turn into a clown car! Make a guess and check how many Basset Hounds come out of there! Wow! Who would expect they would all fit in there! Did you guess right? 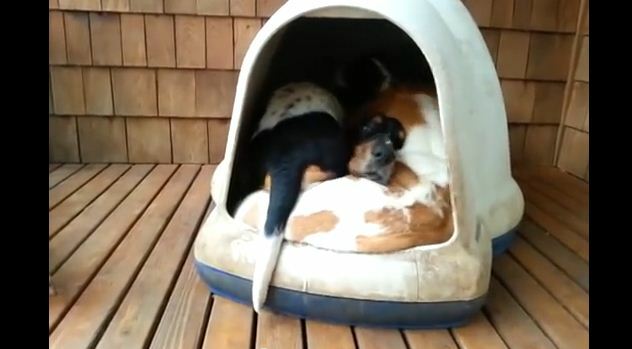 Five Basset Hounds in one doghouse! Amazing and oh-so-cute!